As an HR professional you set the tone for your organization's well being. That's no short task! In a constantly evolving career you have your hands full. How do you manage a full workload and still have time to improve? What kind of skills do the top HR professionals have? It can certainly feel overwhelming without guidance. This ebook offers you proven, actionable steps that you can take to be the best possible resource you can be to your employees. 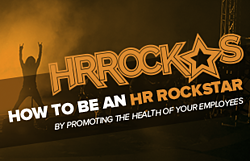 We promise that by reading, you will walk away with the knowledge & guidance required to become the rockstar HR professional your employees will rave about.